Okay, now that we’re all on the same page, you know that in December of 2018, Calloway decided to launch a national “tour,” the details of which were all laid out in her Instagram stories (because, let it be known, she has “an Instagram stories account!”). Attendees who paid $165 for admission were to expect a vegan lunch, “OAT MILK,” orchid crowns, “new friends,” and lessons from Calloway herself on how to build your brand on Instagram. Now, whether or not you think the social media education and “OAT MILK” are worth that price is up to you, but one thing was pretty clear from the get-go: this ambitious tour, which would head to cities such as Boston, Los Angeles, San Francisco, DC, Austin, and Dallas, wasn’t going to happen. Or at least it was clear to journalist Kayleigh Donaldson, who effectively chronicled what she believed to be an outright scam in a thorough Twitter thread since the first Eventbrite pages went up. Shocker, the majority of the tour didn’t happen. Calloway sold tickets to several venue-less events, made a call for photographers who would agree to work for free, asked some attendees if they would consider bringing a brown bag lunch because she got tired of making vegan salads, and purchased 1,200 mason jars that she had to keep in her New York City apartment (this last point isn’t relevant to the alleged scammery, but it’s worth knowing). After pulling off an event in Manhattan, she asked if ticket buyers from other cities wouldn’t mind flying to New York for their event because the space there was just so perfect. People were not super down with this. Then, she discovered Donaldson’s thread, which had caught the attention of Twitter legends such as Roxane Gay and Seth Rogan, and canceled the tour altogether. Until she un-canceled it. And here we are! Last night, Calloway launched a brand new Eventbrite page for The Creativity Workshop by Caroline Calloway. Tickets are still $165 and the tour date, February 9, is actually the same as the original. 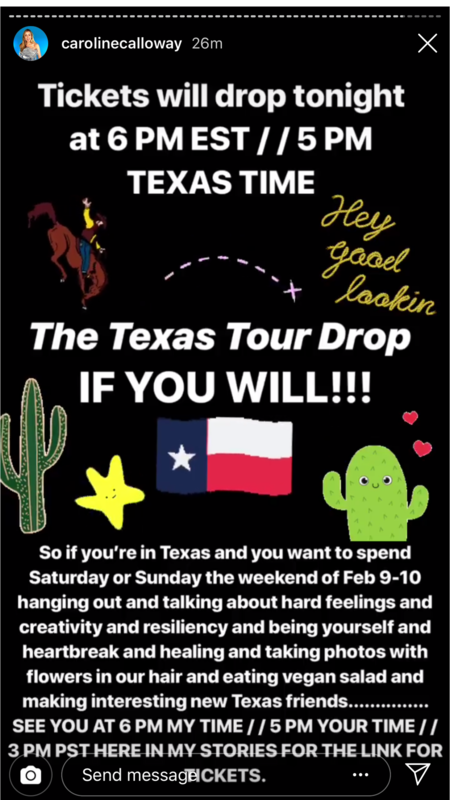 In her Instagram stories yesterday, Calloway promised “hanging out and talking about hard feelings and creativity and resiliency and being yourself and heartbreak and healing and taking photos with flowers in our hair and eating vegan salad and making interesting new Texas friends.” Those who had purchased tickets for the original tour date were given special priority access for booking. Generous! But here’s the thing: Caroline Calloway has been written about plenty, and honestly, I don’t really want to give her any more attention, but with all the new buzz around her, it’s worth making sure anyone who decides to go to this thing is fully up to speed on her history. Do I think Calloway is a scammer? Not really. The link to her and Fyre Festival (as alluded to by The Cut post) is more grounded in the Instagram influencer marketing of it all than actual scammery. Calloway isn’t a Billy McFarland-level sociopath who doesn’t care what happens to the people he scams—she just seems like a twenty-something who’s in way over her head and now owns 1,200 mason jars. She just wants to bring everybody together and wear orchid crowns and drink oat milk lattes and teach people how to garner an Instagram following (the last of which she’s proven she actually can do). If nothing else, maybe we’ll all take a moment to reflect on the power we’ve given to Instagram influencers, and the negative effect their false promises have had on so many.